'Special Working' is what 'we' call occasions when there are events such as engineering work taking place, but they can also extend to other occasions such as altered timetables at Bank Holidays and the all night running that occurs at New Year. However, this piece will really focus on the first example of such an event. As many of you will know, there is an extensive programme of engineering work taking place over many weekends on the District Line which is for the purpose of the need for track replacement. At the present time this is resulting in there being no District line service between Earls Court and Whitechapel and the total suspension of the Circle line on a number of weekends and full details of affected dates can be found on London Underground's web site. Planning such events is very difficult - there is never a 'good' time for these closures and the Powers That Be really have to make a decision on the least bad times for them to take place. Inevitably such closures cause inconvenience to passengers who may have arrived at their local station only to find there is no train service and that they will have to use alternative forms of transport. But where there is no readily available option the norm is for a Rail replacement Bus Service to have been organised, although this may well mean that journey times are increased. Such events are always prominently displayed at affected stations both prior to and during such an event as well as the use of the web site and other media announcements being made, but of course it is inevitable that not everyone notices. I think it fair to say that all of us who work on London Underground have experienced situations though where passengers have not read the posters or listened to the announcements being made both on trains and platforms and end up facing confrontational situations. I certainly have spent many occasions explaining to passengers what's occurring, after they've (basically) not bothered reading the poster or listening to the announcements being made. I've had responses such as 'I didn't bother listening' or 'I didn't think it applied to me'! On occasions it is quite testing on one's good manners. So, that's the background, and a little about how it affects passengers, but how does it affect us as drivers? Essentially, it depends on the extent of the work being undertaken. It can have hardly any effect on a duty, but on occasions such as the current spate of closures, our normal duties go out of the window and are replaced by something completely different. Not only does this affect the work we would normally be undertaking, but it can result in variations to 'book on' and 'book off' times and places as well. These events are therefore accompanied by a Special Timetable for the event which will be used on each occasion that it is repeated. 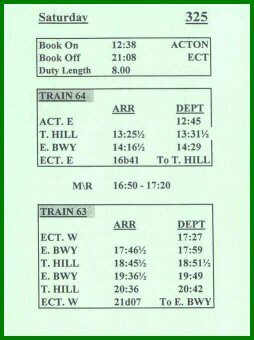 Special Duty Sheets are also produced for the amended timetable. 'I see the scan from the duty book on the page 'Special Working' shows a journey from Ealing to Earls Court E/Bound takes 2 hrs 10 mns! Train 64 is shown leaving Ealing at 14:29, to arrive at EC at 16:39 for a meal break! That's actually a very interesting matter that you've pointed out, and one that I hadn't noticed as I haven't done that particular duty under 'normal working'. What's occurred is this: Duty books are locally prepared (usually by one of the drivers) and then printed up and distributed. BUT they are unofficial, and it is still the responsibility of the individual driver to check his duty and run it accordingly. The Duty books carry a 'disclaimer' to this effect. In preparation the compiler has missed out two (rather important!) lines. The 14:29 Ealing Broadway departure actually goes to Tower Hill, arriving at 15:16 and departing at 15:22. The train then goes back to Ealing Broadway, arriving at 16:08 and departing at 16:19 to arrive at Earls Court (East) at 16:41 as shown. The onus is then on the driver to work out from the timetable exactly what work the duty will undertake. However, this duty was a little unusual in that these trains were both 'Run as Required' specials, which essentially means that there are no timetabled moves for them, and the Line Controller will instruct the driver where he wants him to go, according to service requirements. This situation also routinely applies to the 'Football Specials' which are used when (at our end of the line) Chelsea have a home fixture and of course passenger volumes on the Wimbledon branch are obviously increased. Another point worth mentioning is that the time spans involved are the most the train would be on the road for - they might not be required at all, or could run for a shorter period of time - this will become clearer as this piece progresses. So, the first thing I had to do when I booked on was to find out whether the train would run at all - the DMT on duty said he thought it unlikely, and that I'd just be an additional 'spare' to cover any work that may arise, but that he'd check with the Line Controller. In fact, the Controller did want my train out, so it was off to the depot to find a train! This is done by presenting yourself at the Depot Duty Manager's (DDM) office and asking what train he wants you to take. As is often the case, the DDM didn't know that the train was required, or when he needed to let me move the train to the outlet signal or which end of the depot I'd be leaving, so he then called the Controller. The upshot was that he wanted the train out from the east end of the depot, at it's booked time of 13:15 and that I'd be going to High Street Kensington - which with the Special Working was as far as I could go - on my first eastbound trip. Having established all this, the DDM told me which train he wanted me to take, so off I went to prepare it for service. About ten minutes later the DDM came up to the cab and told me I was OK to move down to the outlet signal, where I'd then wait for the signaller to bring me out onto the 'main'. This all duly occurred, and it was off to High Street. On arrival at High Street I called the Controller to find out where I was to next. As Chelsea were playing at home, I wasn't at all surprised to be told 'Wimbledon driver - give me a call once you're there and I'll let you know where next'. As I changed ends I had a couple of enquiries from passengers (who hadn't read the posters or listened to the announcements being made) about how to get where, and by the time I arrived in the cab, the signal cleared for me to leave. As I approached Earls Court I was held outside the station and as I was waiting there I heard the Controller call the train in the platform ahead 'Train 167 - tell your passengers that there's an empty Wimbledon train right behind you' - obviously as this was now about 13:45 the football crowds were starting to build up. After a couple of minutes, the signals cleared for me and I pulled into Earls Court; sure enough the platform was still pretty full, though not as busy as I've seen it on such days. I remained there for about four minutes which of course not only allowed the train ahead to get o its way, but also allowed a good few more to board my train. The station starter cleared, and off we went to West Brompton. Again the platform was pretty busy, and a couple of minutes were needed to allow all those waiting to get on. Chelsea's ground is located right by Fulham Broadway, so this is where the majority of those on the train detrained. The routine on football days is that a member of station staff will wait by your cab and - either by means of verbal instructions or the use of a hand lamp - there you remain until the crowds have dispersed and you are told it's safe for you to depart. So, the rest of the run to Wimbledon is then quite quiet, but of course the scenario is then repeated all the way back from Wimbledon to Fulham Broadway. As instructed, I called the Controller when I got to Wimbledon who said what I expected; 'Wait until train 167 has departed, give it about five minutes and then back to High Street - give me a call when you get to PG (Parsons Green)' The reason for this last bit is so that he can make sure that the train is then correctly described and signalled through Earls Court. As I make my way back towards Earls Court, there's a bit of traffic on the radio - one train has had a Passenger Alarm activated (not unusual on football days - trains are packed and often someone pulls the alarm handle by accident, but it inevitable causes a delay while the matter is sorted out) but more unusually one of the Football Specials can't get confirmation that the doors have closed at High Street. This is a real problem - not only does it mean that there's a possibly defective train that won't be available for further service until the matter is resolved, but also that there's now a platform out of commission at High Street until the train can be moved. This inevitably means that there's going to be further congestion round Earls Court as trains queue up outside to reverse off the one useable platform. Both these incidents have occurred within a few minutes of each other, and just as I'm approaching Parsons Green, so I'm not too surprised when I can't get a response from the Controller on the radio. So I secure the train and try to get through to him on the phone, but this isn't being answered either. After a couple of minutes I decide to head off for Fulham Broadway and to contact him from there - at least I know that I'll have a couple of minutes whilst the football crowd detrains and clears the platform. But in the event I contact the Controller by radio as I get to Fulham Broadway. I let him know who and where I am; 'Thanks for that driver' is the response. At Fulham Broadway the station starter remains red - a sure sign that congestion through Earls Court is now having an impact. Finally the signal clears and I take a leisurely trip up to West Brompton where, again, I get held for three or so minutes before the signal clears to allow me to leave. As I start to get towards Earls Court the radio comes to life calling me. I'm instructed to detrain at Earls Court and to reverse via 'the Yard' - this is the area just east of the station. I tell the passengers the news, and as I arrive at Earls Court one of my colleagues is standing on the west end of the platform. I've also noticed that the train experiencing the door problems was now in platform 4, with the car lights off, the destination blind showing the train as a 'Special' and a Train Technician in the cab with the driver - a sure sign that the defect hadn't been corrected, and that the train was going back to Ealing Common Depot for further attention. Station staff assist in detraining the train, the signal clears, and I'm able to move the train up to do the reversing move back to platform 3. As I move off I call the Controller again and I'm a little surprised when I'm told 'PG and stow' - meaning to Parsons Green and then stable the train in the sidings there. On arriving at the mark which indicates that I've reached the point where I can change ends to reverse the train and am about to remove my keys, I'm a little surprised when the Passenger Alarm sounds - albeit briefly, so I assume (as it turns out correctly) that it's the other driver I'd seen on the platform letting me know he's on the train and that it'll be moving off immediately. Why he hadn't used the cab-to-cab facility that's built into the P.A. system I'm not quite sure - after all, that's what it's there for! But at least I was aware that something was going on, rather than the train suddenly moving off whilst I'm walking through it - that would have surprised me (to say the least!). I arrive at the west end cab just as we arrive in the platform, and the other driver jumps straight out, not even giving me the chance to why he'd used the rather unorthodox method of communication that he had. I must remember to ask next time I see him. So it's off to Parsons Green once again. On arrival this time though I detrain, take the train into the sidings and having made sure it's fully secured and that all's well, leave it and make my way back to Earls Court. I phone the Acton DMT who confirms that I should make my way back to Acton Town, and I arrive back there at about 15:45. The DMT too was a little surprised that I'd been asked to stable the train at Parsons Green and we came to the conclusion that the plan was to use 'my' train later to replace the one that had been taken out of service with the door problem. He called the Controller, who confirmed that this was, indeed, the case. The DMT also confirmed that my second half train wouldn't be running and that I'd be 'spare' until my book off time. He also asked if I'd take my mealbreak a bit early, which suited me well, as I admit to feeling a bit peckish by now! After I'd enjoyed the delights of the Acton Town canteen for my meal, I checked back with the DMT at about 14:45 who said he'd got a job for me, but it didn't pick up until 18:00 at Earls Court so I had plenty of time in hand to get to Earls Court. He gave me the usual slip of paper with the train number and pick up and hand over times on it, and (the words every driver likes to hear!) that it'd be 'job and finish', meaning I was finished for the day when I got off that train, which was at 20:00, so I'd be getting away an hour early. All this went according to plan and so ended a 'Special Working' duty. Overall a day of both routine and incidents, with the need for flexibility that Run as Required trains often entail.